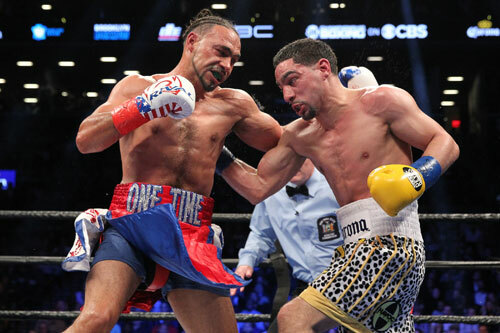 In perhaps the most anticipated fight of 2017 so far, Keith Thurman won a close decision over Danny Garcia in a unification bout of the WBA and WBC welterweight titles, Saturday night at Brooklyn's Barclays Center, before a record-setting live crowd of 16,553, and millions more watching on CBS network television. The match was a showdown of two undefeated 147-pound champs in their primes, with a number of high-profile options lying ahead for the winner. So, big expectations were firmly attached to this event. The fight started with the bang that was expected between the two partial champs, both looking to add another belt to their waist. Garcia jumped out and was having a good opening round before Thurman cracked the Philadelphian, as the round wound down. The punch hurt Garcia and he wobbled slightly. Thurman jumped in and tried to land another bullet, but Garcia avoided any further punishment. The round however, went to Thurman and set the tone for the fight. 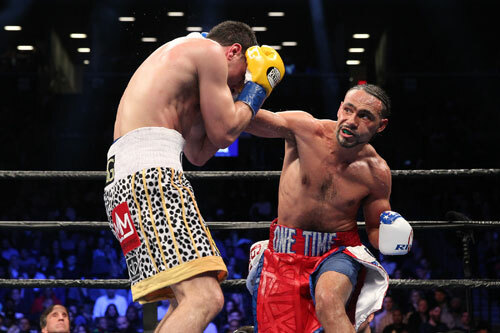 The action remained heated through round five, with Thurman taking the first shift as aggressor. He came to Garcia again and again, which seemed to play right into Garcia's hands. However, the notorious slow-starter was unable to make Thurman pay for his pressure. Garcia battled back in rounds three and five to bring the score close on my card. However, as the middle rounds unfolded, both boxers began fighting cautiously, and suddenly the excitement of the fight faded. The huge crowd booed the lull, but this didn't help to reignite the action. Thurman used his jab and kept his distance from Garcia. As the rounds elapsed, Thurman inched up his lead and appeared to be waiting for the final bell. Garcia, down on the cards in what still felt like a close fight, began to step up his pace down the stretch. But as Garcia surged, Thurman was content to sit on his lead. In round ten, Garcia plastered Thurman with a body shot and the WBA champ felt it. He sagged and grimaced, but the round ended before anything else happened. In the final two rounds, Thurman did little while Garcia pressed forward and threw punches. The shifting momentum kept the fight close, but the show closed on a subdued note instead of an explosion. After twelve full rounds, the official judges turned in a split decision verdict in favor of Thurman. The scores were 115-113 Garcia and 116-112 & 115-113 for Thurman. My card was a 6-6 draw, but three of four of the rounds were extremely close. 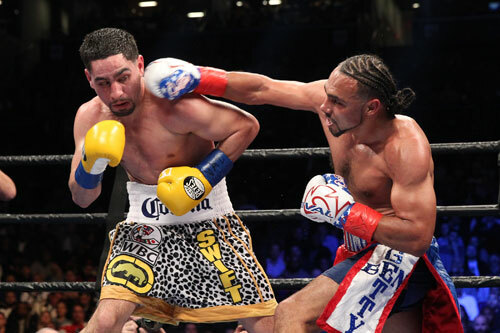 "I thought it was a clear victory, but Danny came to fight," Thurman said. "I thought I out-boxed him." 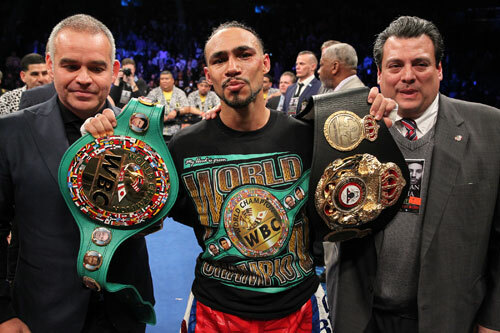 The win made Thurman the WBA and WBC champ and set him up for other big welterweight fights. A loose, unofficial tournament to crown a (virtually) undisputed champion appears to be underway, with Errol Spence set to fight Kell Brook on May 27 for the IBF title and Shawn Porter scheduled to meet Andre Berto on April 22 in a WBC eliminator. Thurman will eventually face the winners of these pairings. 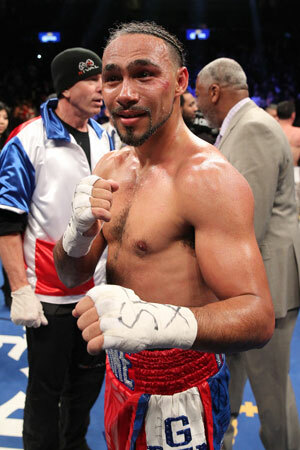 Garcia lost for the first time in his nine year career, and showed class and good sportsmanship in defeat. "I came up short tonight," said Garcia. "I thought I was the aggressor. I thought I pushed the pace, but it didn't go my way. But I take my losses like I take my wins. I'll come back strong like a true champion. I would love a rematch." Garcia's father and trainer Angel Garcia, did not take the defeat with his son's grace. The outspoken and hot-headed Angel Garcia questioned the decision and Thurman's tactics. "How do you win a champion-ship running?," Angel said. "Right now, I'm disgusted with boxing. I want Danny to retire right now. We're not a steppingstone for nobody." Leading up to the event, the boxing hype machine tried to draw comparisons between Thurman-Garcia and the 1981 classic between Sugar Ray Leonard and Thomas Hearns. 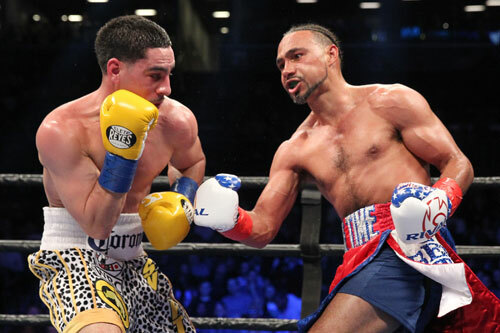 Although some basic similarities between the two welterweight unification bouts existed, Thurman-Garcia did not come close to the excitement or stakes of that thirty five year old masterpiece of pugilism. Instead, Thurman-Garcia was a much closer match to 1999's Felix Trinidad vs. Oscar De La Hoya WBC/IBF unification fight. Like Oscar and Felix, Thurman and Garcia fought like two men who could not afford to take a risk of losing. It was an attitude that produced a fight that wasn't bad, but was also no where near what the fans had hoped for. 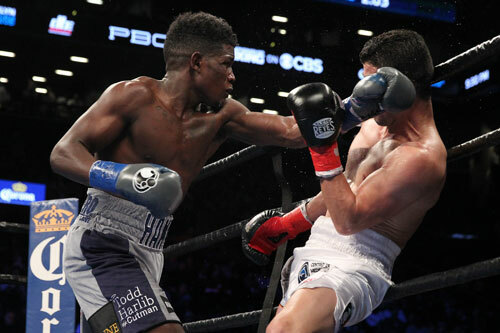 In the nationally televised co-feature bout scheduled for twelve rounds, southpaw Eric Lubin, Orlando, 18-0, 13 KOs, remained undefeated with an impressive fourth round TKO of Mexican Jorge Cota, 23-2, 20 KOs. Lublin took the first three rounds, then knocked Cota down with an overhand left in round four. Referee Earl Brown stopped the bout at the 1:25 mark of the fourth. With the win, Lublin became the mandatory challenger for the WBC 154 pound title. 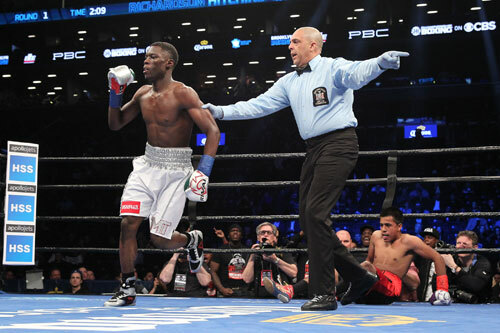 Brooklyn welterweight Richardson Hitchins, 1-0, 1 KO, made a successful pro debut with a quick TKO of Mexican Mario Perez, 1-1, in their scheduled four rounder. Hitchins looked sharp, dropping Perez twice and winning the bout after just 1:33. The referee was Eric Dali. 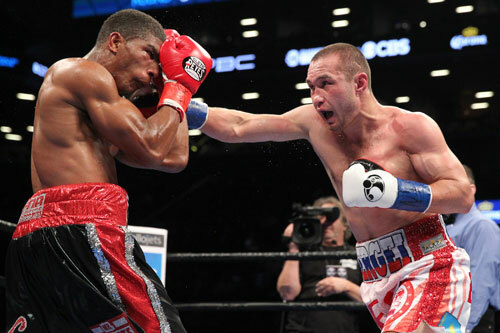 Beverly Hills-based junior welterweight Sergey Lipinete, 12-0, 10 KOs, stopped Clarence Booth, St. Petersburg, FL, 14-3, 7 KOs, in round seven of their scheduled eight rounder. Lipinete controlled most of the action through the first six rounds before knocking down Booth and finishing him at 1:33 of the seventh round. The referee was Gary Rosato. Chicago light heavyweight Andrzej Fonfara, 29-4, 17 KOs, bounced back from his surprise loss to Joe Smith Jr. with a 10th round TKO of Chad Dawson, New Haven, CT, 34-5, 19 KOs, in the final round of their fight. 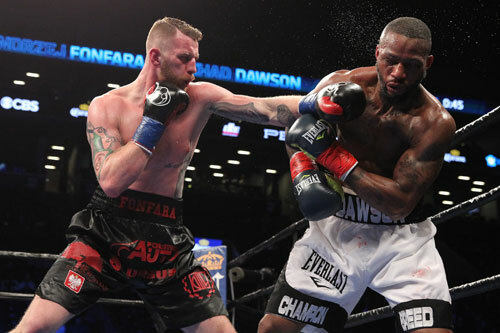 Fonfara dropped Dawson in round nine and finished him early in the tenth. A hard right staggered Dawson and Fonfara poured it on until referee David Fields stopped the fight with Dawson hurt in a neutral corner. The time was 38 seconds of the 10th. 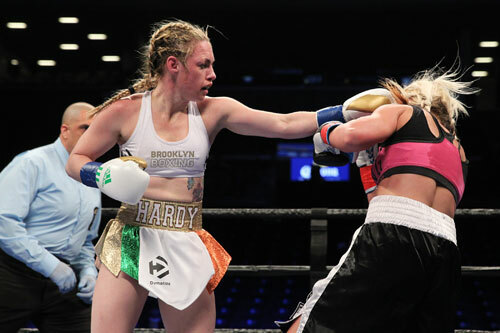 In the opening bout at the Barclays Center in Brooklyn, NY, WBC International featherweight women's champion, Heather Hardy, 19-0, 4 KOs, won an 8-round unanimous decision over Edina Kiss of Budapest, 13-3, 8 KOs, to retain her title. It was a work-woman-like performance by the Brooklyn fighter, and although she won by one-sided scores of 80-72 twice and 79-73, she had to fight with a swollen right eye in the second half. Inexplicably, the popular Hardy fought the first bout of the night before a mostly empty arena. Mario Barrios, San Antonio, TX, 18-0, 10 KOs, stopped Yardley Suarez of Mexico, 20-7, 11 KOs, in round six of a scheduled 8-round junior lightweight fight. The time was 0:25. Philadelphian Thomas (TJ) Velasquez, 6-0, 5 KOs, knocked out Detroit’s James Lester, 11-12-1, 4 KOs, in the first round of a scheduled 6-round junior welterweight bout. The time was 2:25. Colorado featherweight Ricky Lopez, 18-4, 6 KOs, won a 6-round split decision over Houston's Pablo Cruz, 14-2, 6 KOs. The scores were 58-56 & 58-56 for Lopez and 58-56 for Cruz.